UK's 3D HTC coming soon? Two new HTC handsets have snuck out of fairytale myth and into reality, codenamed HTC Rider and HTC Kingdom. With apt names, given the rather major national event occurring on Friday, the two handsets have been snapped in a covert yet blurry fashion. The HTC Rider is shown running Android in a red chassis with four navigation buttons at the bottom of the screen – these look to be physical buttons rather than touch sensitive ones, which is a little strange. 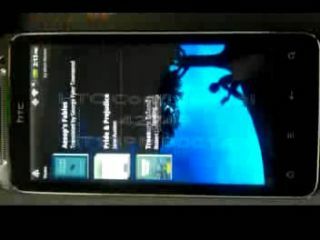 One site is suggesting this could be a prototype of the GSM version of the HTC Evo 3D, HTC's US 3D phone. Meanwhile, the HTC Kingdom looks very similar, although this time in a silver suit, like a knight. Unfortunately the picture is of equally low quality so there's not much detail to be gleaned here either – although the hawk-eyed will notice the Android OS and what could be a front-facing camera. Either that or it's a screw.